"Brie Larson Wears A Billowy Long-Sleeve Shirt And White Saddle Shoes"
On a recent episode of Comedy Bang! Bang! the podcast, Scott Aukerman called “Brie Larson Wears A Billowy Long-Sleeve Shirt And White Saddle Shoes” (quite the mouthful) one of his favorite episodes of this particular cycle. So even with that added pressure, it’s difficult to come out of watching this week’s episode of Comedy Bang! Bang! without feeling the same thing. Sure, this is only the third episode in this half of the fourth season, but even including the rest of the episodes from the first half, this stands out as a top one. Part of that is the framing device: an ‘80s/early ‘90s “ragtag crew of misfits” on summer vacation, which is just so ripe with comedic possibilities. Another part of that is the always delightful Brie Larson, who is game to be just as weird as the show wants her to be. Then there’s of course the part of the very fresh Scott and Kid Cudi (also know as “the other Scott and Scott,” as of right now) relationship, which only gets better with each week. Which brings us to the fun of summer vacation and all of the Comedy Bang! Bang! crew leaving for L. Jefe Maninchargo’s Cancun Beach Blowout—except for Scott and Kid Cudi, as the episode order has been doubled, effective immediately. Even before it gets to the meat of the ragtag replacement crew plot, it’s a nice nod to the fact that Comedy Bang! Bang! keeps having longer seasons (and Scott Aukerman keeps getting less sleep). The growing episode orders for Comedy Bang! Bang! have been both a blessing and a curse, giving the audience a lot of a good things but also falling victim to simple fatigue or poor execution in the case of some episodes. Comedy Bang! Bang! isn’t showing major signs of running out of ideas though, and that’s why it’s able to wait until the fourth season to bust out the “team of losers coming together to make something better” trope. In keeping with the Summer School vibe the episode is going for, Scott’s complete indifference to all of it makes him the perfect reluctant leader who learns a lesson at the end. But in true Comedy Bang! Bang! fashion, he really doesn’t. Even as Brie Larson tries to convince him to get invested in crew members Data and Spliff’s interests or Kid Cudi explains to him that the summer crew are actually a pretty good bunch of people when you get to know them, Scott feels nothing but gas. As ridiculous as this show is, it would ring false if he did suddenly transform into the lovable leader at the end; but because of how ridiculous this show is, there is unearned acceptance (and green screen surfing! ), right along with the episode’s Breakfast Club meets ’90s TNBC meets Stephen J. Cannell ending. With all of this, the episode even manages to cram in some quick commentary on the state of summer television. Summer television has evolved so much in the 21st century, but there are still those mainstays of terrible summer television that just won’t seem to die. And they don’t need to, because there is a place for them, typically for the same people who believe “there’s nothing good on TV anymore.” So for the brief commercial bit that advertises “new episodes of bad shows!” there’s a sense of familiarity. Because even with shows like Hannibal or Rectify on in the summer, there is still that mindless summer television permeating the airwaves. You know, shows like: Hunk Island, Naughty Butlers, Babe Island, Final Funnyman Upright, Sunburned Fat Guy Island, Pimp My Bride, State Underneath The Plate, and Major League Baseball. That’s all just in a commercial break, and Comedy Bang! Bang! nails it. So soon after the premiere’s one-man show for Scott, Comedy Bang! Bang! also nails the fake theatre bit again in this episode with Kid Cudi’s Temptations musical. Honestly, as far as I’m concerned, this is what Jersey Boys is like: Everyone just sings “Big Girls Don’t Cry” 58 times in the span of three hours. The repetitive nature of the “Just My Imagination” cues (along with the fake-outs) is reminiscent of Comedy Bang! Bang! the podcast’s bit about Paul Rust, chemicals, and Walter White—the ultimate reminder that, when in doubt, repetition is always hilarious. The kicker of the two glowing reviews for the musical also being from the writers of said musical is almost a blink-and-you-miss-it joke, because by that point, the focus really is on when and how they’re going to start singing “Just My Imagination” again. At the beginning of the sketch, it’s a wonder that Comedy Bang! Bang! even got the rights to play the Temptations’ songs, which is what makes it so satisfying when that becomes the joke (especially with the “My Girl” tease and naming the musical Ain’t Too Proud To Beg). Scott’s small part in the musical just tips it all over the top, as though it weren’t already there. And last, but not least, guests Brie Larson and—eventually—Fourvel (and Threevel) all bring this episode together. In a change of pace, Brie Larson doesn’t have the same subtle quietness as the past two guests, and she’s also fully committed to everything in the show from the moment she enters. A lot of the best lines of the episode are actually from her, which isn’t always the case with the celebrity guests. Her reaction to Scott saying to play the clip from the musical—“Where?”—is kind of a brilliant touch even though the moment is over as soon as it happens. And her hushed admission of being abducted by aliens (“The Dawning is coming”) plays even better after the initial whisper conversation between Scott and Kid Cudi earlier in the episode, as does the reveal that she may or may not be a “real nerdo.” As for the recurring character this week, Fourvel’s last appearance on Comedy Bang! Bang! was more of a miss than hit, but the character always finds a way back, even as an orphan. Him cleaning up his language (but just barely) for a pretty lady like Brie Larson makes for a little spin on the schtick, as does his familiarity and former rap group with Kid Cudi (with Fourvel being known as “Kid Cutty”). The exasperated yet gleeful way in which Bobby Moynihan lists off Fourvel’s Tips On Heat is well worth the $863.00 he earns for it. “Brie Larson Wears A Billowy Long-Sleeve Shirt And White Saddle Shoes” is a hilarious, packed episode of Comedy Bang! Bang! and Scott Aukerman has all the reasons in the world to truly be proud of it. I’d like to think that’s not just my imagination. Scott’s Onscreen Credit: Top Secret Plan. So it’s a shame the plan (to tank the show) backfires tremendously. Scott calling himself “Scotty 2 Hotty” is just proof that wrestling follows me. Based on an aside Brie has with Scott as they come back from commercial, I’m now curious: What if Leonardo DiCaprio had retired after What’s Eating Gilbert Grape? By the way, the awards Ain’t Too Proud To Beg won for Best New Musical and Best Song are Toni—not Tony—awards. “Dee Graham-Finale of Act 4 Magazine.” Ah. I’ve watched a lot of Silk Stalkings—I know the Stephen J. Cannell production bumper like the back of my hand. Also, if you watch that wrap-up scene on mute, it’s even more amazing. 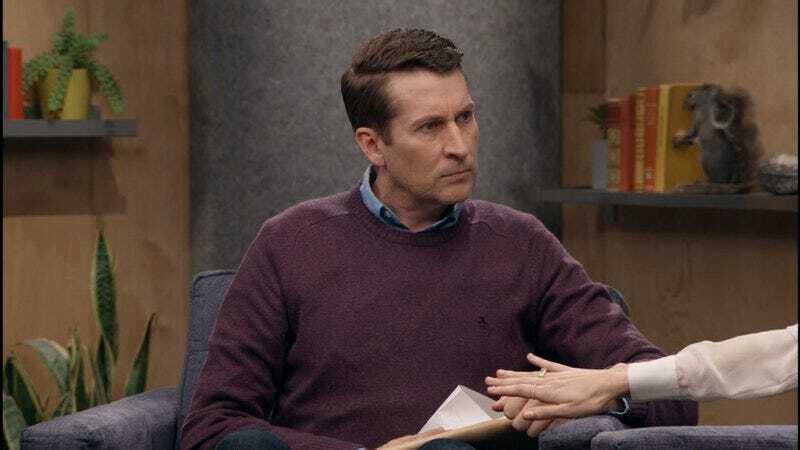 Everyone looks certifiably insane, even “certifiable dum dum” Scott Aukerman. Spliff saying “dank nugs” is just the reminder of Pauly Shore’s (and Encino Man’s) existence that we all need. “I put a watermelon up my shirt to extort money from a senator.” I smell episode sequel. Eric the PA gets his groove back, and while he ends the episode with braids that are supposed to be like Angela Bassett’s in How Stella Got Her Groove Back, they look more like Bo Derek’s braids in 10.